Update: See the best supermoon eclipse videos here. You've been waiting for this since 1982. No, not the re-release of "Rocky III." We're talking about the last time a particular astronomical two-fer occurred: a simultaneous supermoon and lunar eclipse. On Sunday night, that concurrence will take place again, for the last time until 2033. Both a full moon and lunar eclipse occur when the Earth is between the moon and the sun. In the case of the lunar eclipse, there's the additional factor that the moon, Earth and sun are precisely lined up, so that the moon passes through the Earth's shadow. 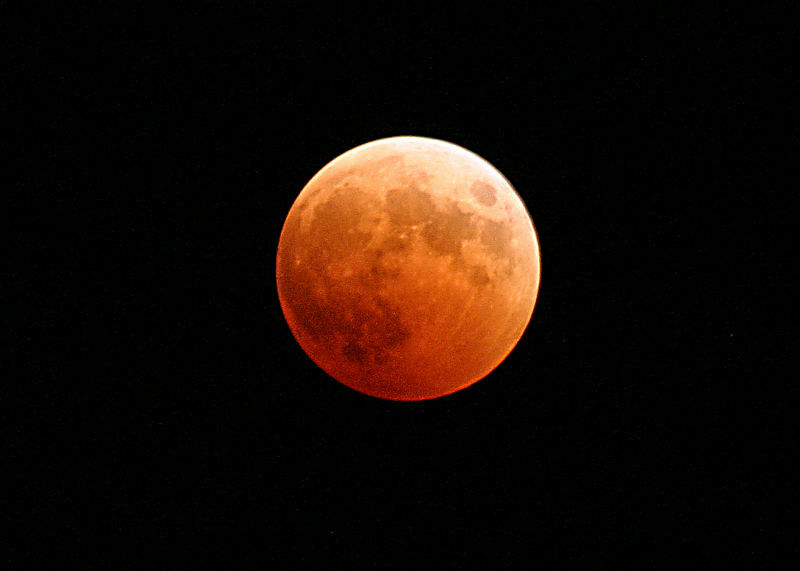 A lunar eclipse always occurs during a full moon. Lunar perigee means the moon's orbit will take it as close to the Earth during this lunar month as it's going to get (we hope) -- a mere 222,000 miles away. When a full moon coincides with lunar perigee, it's called a supermoon, because the moon should appear slightly larger than average. “Supermoon is not an astronomical term, but was invented by the media to make things more exciting sounding," says Andrew Fraknoi, chair of the astronomy department at Foothill College in Los Altos Hills, and one of our go-to guys on things astronomical. "The average person can't really tell the difference between a supermoon and an ordinary moon, so it's not quite as super a phenomenon as the term makes it sound." All right, sir. But throw in that eclipse -- now you’re talking. Fraknoi recommends that you start watching when the moon rises, around 7 p.m. Pacific Time. The total eclipse starts at 7:11 p.m. and ends at 8:23 p.m.
Where is the best location to see it? Look to the east! The moon will appear low on the eastern horizon as it rises. Which could be a problem for some would-be observers. “Many of us don’t have a view of the eastern horizon -- a building or a hill might be in the way," Fraknoi notes. But by the time the eclipse ends, he says, the moon will have risen considerably in the sky, and it will be be easier to glimpse. If you want to see the entire eclipse, though, you should get to higher ground. Fraknoi also recommends checking the weather in advance, so you can get to a spot without clouds or fog should those be in the forecast. If you’re in San Francisco, especially, the further east, south or north you go, the more likely you are to hit clear skies, he says. Your own peepers will do the trick -- you don’t need a telescope or binoculars. Unless you’re a werewolf, there’s no danger in looking at the moon. As the Earth’s shadow is cast on the moon, it will slowly darken, until the moon is completely covered: a total eclipse. “The full moon doesn’t go completely dark,” says Fraknoi. “It will become a little bit reddish. That’s because the earth has an atmosphere and the atmosphere acts a bit like a lens, and so the red colors, particularly from the sunlight, will be bent inward toward the moon." Where can I go to watch this with other people, in case the world is coming to an end? Chabot Space & Science Center – 7 to 9:30 pm; $10. Children two and under free. After 7 p.m. tickets available at the door only. Chabot Space & Science Center’s observatory deck will host a view to a rare and beautiful astronomical event, a Total Lunar Eclipse. Enjoy the spectacle in good company as the fully eclipsed Moon rises above the tree line of the East Bay Hills. In addition to the telescopes in our rooftop observatory, a telescope will be set up on theCollege Center Terrace from 6:30~7:30 pm, and will be staffed by our astronomy faculty, for viewing and photographing the moon as it rises above the horizon. Also, courtesy of the CSM Astronomy Department, astronomy student volunteers will have binoculars available to view the supermoon. Dress warmly and remember that this event is weather dependent. So, before coming to the campus, check our website for any changes in the venue due to weather conditions. Join the SFAA for a public viewing party on Sunday evening September 27th of the Harvest Moon Lunar Eclipse. We will gather at Pier 15 along the Embarcadero in San Francisco with a spectacular view of the San Francisco Bay and the magical sight of the Harvest Moon rising in the east in total eclipse. Plan to arrive between 6:00 and 7:00 pm. Subject to cancellation if there is cloudy or inclement weather. What if I can’t get out or just prefer to experience the majesty of this event the way I do everything – on the Web? The University of Arizona's Mt. Lemmon SkyCenter will also be posting images as they come in.